When I told my husband the kind of cookies I was making these Maple Bacon Chocolate Chip Cookies, he kind of gave me the stink eye. He then proceeded to eat three once he tasted them. On the other hand, when I saw this recipe, the ingredients of course made perfect sense to me. Bacon…chocolate…sweet…salty….heck yeah. This is a really interesting cookie. It doesn’t taste like bacon, but because the bacon doesn’t dissolve into the ingredients, you get this lingering, chewy, salty and sweet ending. It’s nice. Have I mentioned how much I love bacon? I even added more bacon to the recipe so I would have extra to sprinkle on top of the cookie. However, if you want to disguise the bacon in the cookie, just don’t sprinkle any on top. 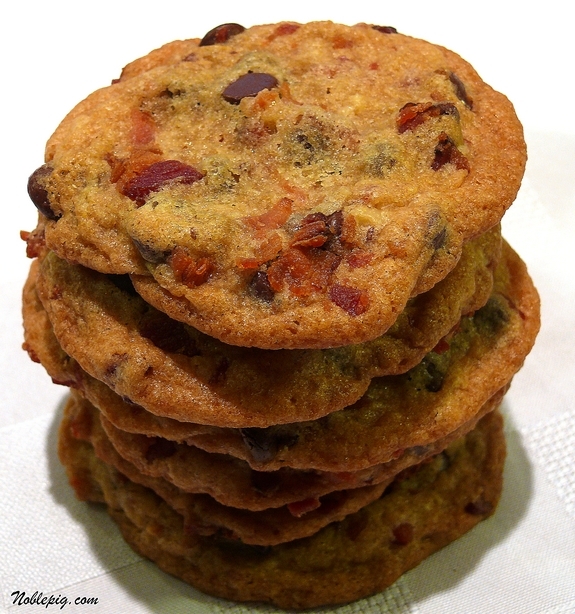 The maple smoked bacon really adds and creates an intensity of flavor in this cookie, one I will not soon forget. You will love them, I promise. Cook bacon in a large skillet over medium heat until browned and cooked through. Drain on a paper-towel lined plate and chop finely. In a medium bowl whisk flour, baking soda and salt. In a large bowl, using an electric or stand mixer, cream the butter and sugars; about three minutes. Add egg and maple extract and beat until just blended. 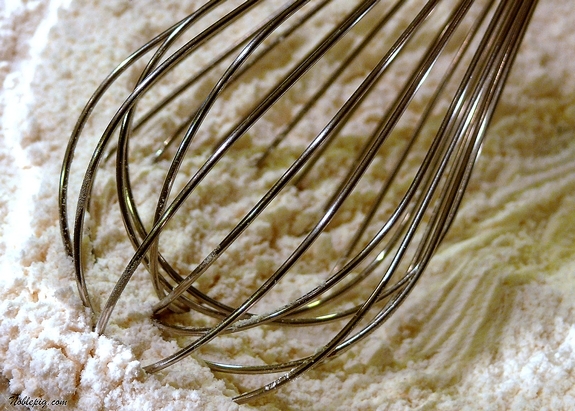 Add the dry ingredients; beat until just incorporated and the flour is dissolved. Stir in the chocolate chips, walnuts and bacon. 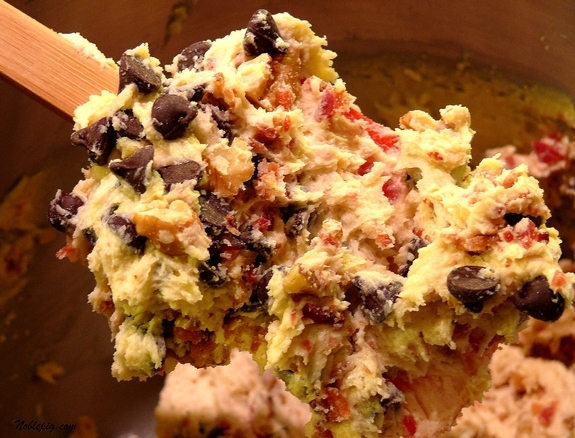 Drop one large Tablespoon of cookie dough 2-3 inches apart. Make sure you only do about 6 cookies on a sheet. If they spread and touch each other, you will have a mess. Bake 10-12 minutes in a 350 degree oven only until the edges are brown and slightly soft in the center. Let them finish cooking out of the oven, on the pan. The edges will get too dark if you leave them in the oven. Transfer to a wire rack and let completely cool. Also, I made 3 extra pieces of bacon so I would have enough to sprinkle on the top of the cookie dough. I also pressed in some extra chocolate chips too. This is completely optional. It has bacon in it, so it’s good for breakfast right? In a large bowl, using an electric mixer, cream the butter and sugars; about three minutes. Add egg and maple extract and beat until just blended. Add the dry ingredients; beat until just incorporated and the flour is dissolved. Stir in the chocolate chips, walnuts and bacon. *Also, I made 3 extra pieces of bacon so I would have enough to sprinkle on the top of the cookie dough. I also pressed in some extra chocolate chips too. This is completely optional. **Chilling the dough before baking can also help with the cookies not spreading so much. Only you could combine bacon and chocolate chips. Oh Cathy I need to make these. You know I am short distance from Smithfield and Gwaltney! Bacon is in my blood, well at least according to my cholesterol reading. I tried a bacon maple cookie a while back and it’s now tied with Nestle’s Toll House chocolate chip cookie recipe for my favorite cookie. I love the juxtaposition of salty and sweet. I also made and sold the maple bacon cookies at the local farmers market. Sure, some people turned up their noses and passed on by, but more people were intrigued by the idea and I soon sold out. My kids, MIL, and SIL were all so freaked out by the idea that I was barely able to get them to try the cookies, LOL. I think you have to not tell people what they are first. Dh agrees that they’re wonderful at least. FIL likes them, but he’s like Mikey and would eat anything. Though I’ll probably try this, I have a feeling I’ll like it without the chocolate chips better. It seems the chocolate might just make it too much on the sweet side. Oh. My. Gahw. I am so making these! I had the same reaction as the Wild Boar at first. 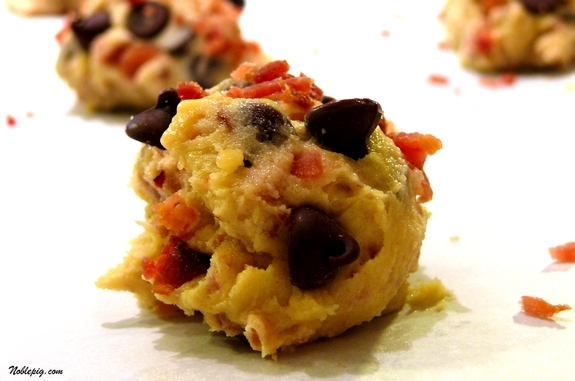 Bacon in a cookie? How absurd I thought. Then after looking at the photos, I began to get the desire to at least smell them hot out of the oven, then before I knew it, I was writing my grocery list to get what I need to try them! It’s all about intrigue. I must do it for myself, because we love bacon also. Thanks! This is so funny…Kevin at Closet Cooking made these same cookies and your’s and his look SO yummy! totally breakfast-appropriate. totally. crispy, salty, chocolate–these are everything i crave in a cookie, so my hat’s off to you! I LOVE bacon and chocolate chip cookies. I will be making this one! I laughed that you get the stink eye from your guy too. Love, love, love bacon – these’ll be great for the big guy and his huntin’ partner when they take off to go “pig” huntin’. Bacon cookies! Genius 🙂 I have to make cookies for a cookie swap at work (oy) and am planning some chocolate banana nonsense… these might have to be on deck (not for swapping)… saving! yes! you know I’m loving these! I’ve really got to give this bacon and chocolate thing a try! I was going to tell you about Kevin’s post at Closet Cooking, too, but looks like others already did. Too funny. Really, gotta try it and what better thing to try the combo in first than a ccc! I love chocolate dipped bacon strips, so I’m thinking this is a perfect combo. My college child loves the chocolate and bacon too–we might have to try these when she is home next week! 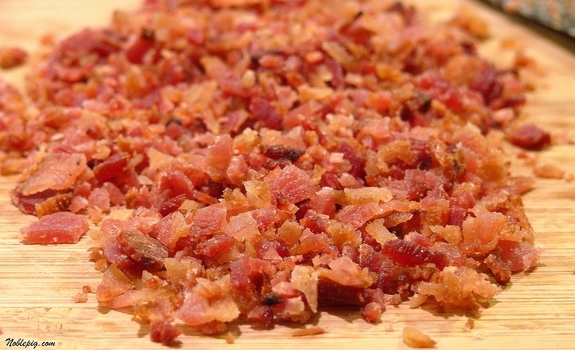 My boyfriend is a bacon freak – I may be making some of these today! OMG… only sorry I didn;t see this before my neighborhood cookie exchange… next year for sure!!! Oh my!! There’s not much I love more than bacon! These look ‘to die for’! I better make these before I start my New Years Resolution. I would not be able to exercise any will power with these in the house! nope not goin for this one. I did make the suarkraut cake out of sheer curiosity but bacon in my cookies — nope nada. How bout some nice holiday libations? I admit, that when I saw this on Kevin’s website (closet cooking) I crinkled my nose. After reading your post, I am reconsidering. My husband is crazy about bacon, so why not? I’ll scale it down, not tell him what’s in it and see how it goes. Wish me luck! Oh yes, oh yes. This I will try! This is a completely logical combo of flavors…I have to find the smoked bacon now!! Now two people whose judgment I respect are touting the use of bacon in cookies. There must be something to this. Holy yum! I have to make these for my cookie exchange – so different! I made HUGE cinnamon chip cookies for my step-son for his birthday – my secret was to sprinkle course sea salt on the top of each cookie before baking – I may add this step to your recipe. Thanks! I just had a large lunch, and now my stomach is growling! Yum to the 9th degree. I had to come see this as soon as I noticed the post. I love sweet and salty. 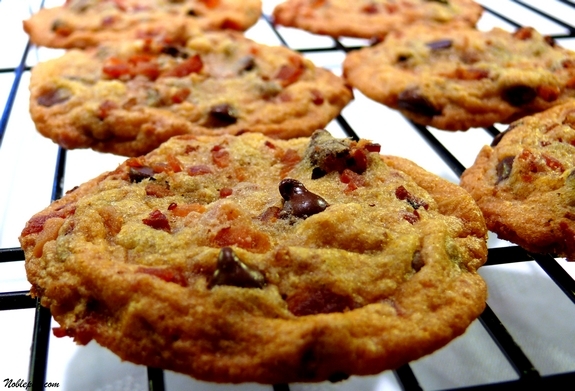 Chocolate and bacon are awesome together, I would love to try this cookie! Wow, these look really good…and interesting! Haha. I am always getting emails from my husband that carry links to bacon products–bacon mayo, bacon air freshener, bacon toothpaste–he’s a bit of a bacon freak! So I am about to send him a link to this recipe. I guarantee I will receive a phone call immediately upon his reading it, begging me to make them! It just proves our theory that bacon goes with everything. Thanks, Cathy! Those cookies have the perfect spread! I would love to taste one. So, I don’t know if it’s just my inattentiveness, but when I sat down to make these I noticed that salt is missing from the ingredients list, but it is listed on the steps to making it. Just wondering if that is a typo of sorts, or just my (mild) insanity. I’ve been looking to make something like this! Thanks for the recipe!! Whoops! 1/2 teaspoon…thanks for letting me know. Now these took my breth away. Wow what a wonderful combination of flavors. I meant to say breath. Too excited about the snow storm coming in and I’m all out of milk and bread! Gotta hit the store right away. What a completely insane but logical idea. This is a cookie you could fall in love with. I must stay away. What is not to LOVE about these cookies???? yum yum YUM! I have to try this!! These do sound yummy! And I’ve gotta laugh at the stink eye. It’s incentive really. I’m a sweet/salty freak too. Love this recipe. Whoa. I just made these by dropping the tablespoons into holiday cookie cutters. They turned out better than I thought! Thanks for the recipe! Yum! Just saw this via Twitter and I *will* be making these this weekend….and reading your blog! If I want to use maple syrup instead of maple extract, how much syrup should I use? Maple syrup is not a substitute for maple extract. An extract is a concentrated flavoring and is used to add flavor without adding other ingredients. You would have to add so much maple syrup it would change the consistency of the recipe. Loved this recipe. Used milk chocolate and skipped the nuts. It was wonderful! It really looks very delicious. I must try to make all these recepies. Thanks for sharing such delicious dishes with us. I saw a variant of this recipe that had a maple glazing with a piece of bacon for a garnish. It is an interesting combination of flavors…salty bacon and sweet chocolate should go great together. I like your site because you include very detailed images of the cooking process, not just the finished product. Very helpful!! I just made these cookies and they’re brilliant. I referenced your recipe and blog in my write up (http://francoisesmiscellany.wordpress.com/2011/03/10/bacon-chocolate-chip-cookies/). Thanks so much for this great recipe. If you substitute half of you butter for bacon drippings (I know, gross, but read on) you’d get a more thorough bacon flavor throughout the cookie. I’ve tried making with this and without and the difference is incredible. Great cookie, it’s best the next day more flavor. Pitting sea salt on top before baking and not in cookie gives it a nice over all taste. 🙂 I would make it again but I would play with making it thicker? These look great; thanks for the recipe! I am going to make these for a cookie exchange. Can you tell me how many cookies this recipe makes? I wonder if these travel well? I have a friend in another state I would love to send these to at Christmas. Hmm, never tried shipping them. Just wondering if you have any advice on a maple extract substitution. We accidentally bought pure maple syrup.. Any thoughts? Extract is concentrated so yes, it is not the same and will not yield a maple flavor without it. So sorry, I don’t know of any substitution except another extract…but then you won’t have maple flavor.